In the Form Builder click on the Submit button field Properties. Then select Advanced tab and turn "ON" Print Button option. Questions, suggestions and feedbacks? Please let us know below! I have created a form and would like to have the print button BEFORE the SUBMIT button please. Will you explain how I can do this? Is there a way to add a print button to the "Thank you" page after they submit? I added their summary there and want them to be able to print there. Because a mass email had gone out, I had to remove the PRINT button from the forms to keep people from trying to print when they couldn't. I had the print button on the forms and I had gone into the settings as instructed before. One of the answers was correct in that I did not have page breaks set so I will try that. This form uses the 1 QUESTION PER PAGE format. How do we ADD the print function? Hey guys, when I do this, I'm left with BOTH the "Submit" & the "Print Form" in the same line. How do I remove the "Submit" option? It seems to be difficult to create 2 fields side by side. Eg: I want to create 2 fields, one for name and one for contact number, but I want them to next to each other. I only seem to be able to create boxes below each other. Regarding the above question, I want to keep the submit form button and have the option to print form if I want. I presently have submit form and a print form button. If I click on print form, how do I get the information also sent to me? Thank you. You solved my problem. I was working with Firefox and that's where the trouble occurred. IE seemed to make it even worse, but when I finally tried Chrome, the printout came out just fine. When reviewing a submitted form and trying to print it, essay-type text often overflows from page to page and gets intermingled with the text on the next page. Is there any way to fix that? 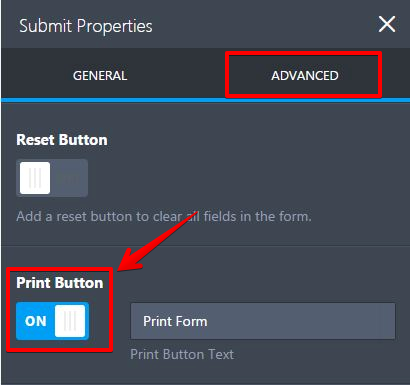 Is it possible to have just a Print Form button with no Submit button? I would like to make a "partial print": the user would start answering the form, then print a page (the printed page would have a few infos supplied by the user, up to that point of the form), sign the print, submit it (digitalized, via form) and then continue answering. I'm having trouble with stablishing a layout for the print. As far as I searched, the Print Button only makes a hard copy, witch doesn't help me. Can it be done? Print just a few fieds? When trying to print my forms, it comes out with too small letters, that are not legible, any suggestions on how to change the printing settings? Can the Print Button code from the forms be transferred the thank you Html? I have no way to find this these menu options from my "Form buider" screen!! Any help??? Can a print button be coded into an auto-response email? I would like to emphasize to the students filling out my form that they need to print it FIRST and then submit it. It will be too late to print it if they submit it first. I can't seem to get the print button to show up before the submit button. Can you help? Thanks! 1.- How I can change the text "Clear Form" to "Limpiar Formulario" ? 2.- How I can insert Page break buttons "Back" and "Forward" on my form Venta de Barcos ? 1º.- Como puedo cambiar el texto de "Clear Form" a "Limpiar Formulario" ? 2º.- Como puedo introducir los botones de Page break "Atras" y "Adelante" en mi formulario de Venta de Barcos ? The print button is not aligned vertically with the other two submit buttons on my form. There doesn't seem to be a method for aligning them. When printing using this method, everything except for the image button prints (including the captcha). When I choose to duplicate a form, it brings up a shortened version of it with only very few fields. The form does not duplicate. Can someone help so that I do not have to create all new forms to be able to have them print correctly? Thank you. you can change the text on submit button, however the rest of the two buttons remains same and can't be changed. I use two separate site with two different languages. it seems weird on a form which has everything in one language except the print or reset buttons.